Today was the first day of planning with the full science team since Curiosity had an anomaly on sol 2172. It has been a over a month since we last looked at the "workspace," the region in front of the rover that the arm can reach, and there were some surprises in store for us! 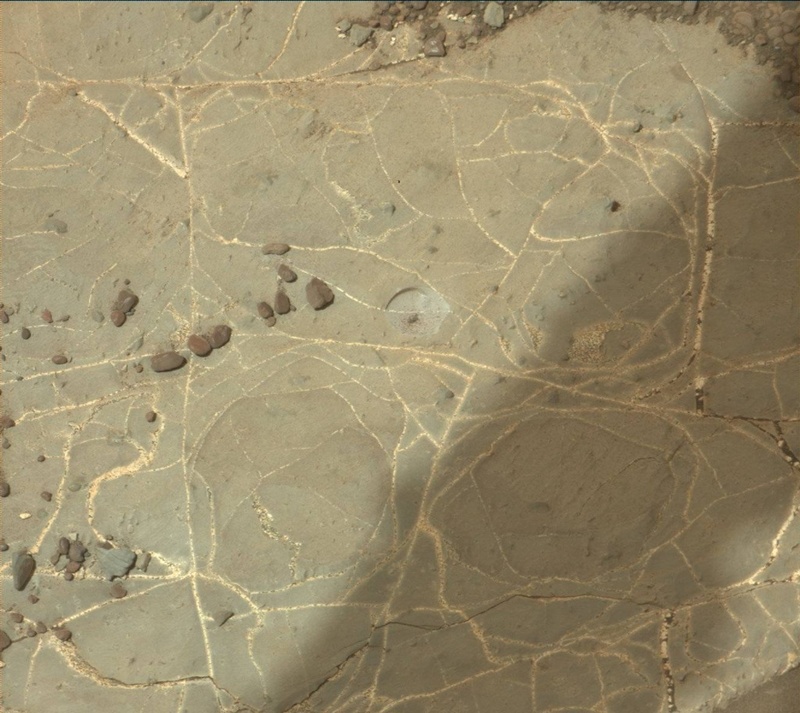 Before the anomaly, the rock was covered with gray-colored tailings from our failed attempt to drill the "Inverness" target, as seen in the Mastcam image from sol 2170. In the new image above, however, those tailings are now gone - and so is a lot of the dark brown soil and reddish dust. So while Curiosity has been sitting still, the winds have been moving, sweeping the workspace clean. Later this week we plan to take advantage of this freshly-scrubbed surface by taking close-up MAHLI images of fine details in the rock, including the light-toned veins crisscrossing the outcrop that are peppered with interesting dark inclusions. Today we're easing back into science operations, taking MAHLI images with the cover open and closed to inspect how much dust is on the cover, a MAHLI image of the REMS UV sensor, a ChemCam observation of the vein target "Grange," and some Mastcam images of the nearby ripple field "Sandend" to look for more changes due to the wind. In my role as a Long-Term Planner, I've got my eye on the road ahead, and I'm excited for Curiosity to drive to a new spot where we can successfully drill into the gray rock. Soon the wind won't be the only thing moving around here! Sols 2386-2387: A new drill hole! The drilling planned for last weekend was successful, so the top priority for Sol 2386 is to drop portions of the Kilmarie sample onto a closed SAM inlet cover and take Mastcam images after each dropoff to characterize the size of each portion.